This is a project we created in February for Dr. King’s birthday and black history month, but it’s just as historically important in March when Dr. King led the peaceful voting rights protests back in 1965. On March 21st, 1965 some 2,000 people set out on a march from Selma Alabama, protected by U.S. Army troops and the Alabama National Guard. After walking 12 hours a day and sleeping in fields along the way, they reached Montgomery on March 25. Nearly 50,000 supporters—black and white—met the marchers in Montgomery, where they gathered in front of the state capitol to hear King and other speakers address the crowd. 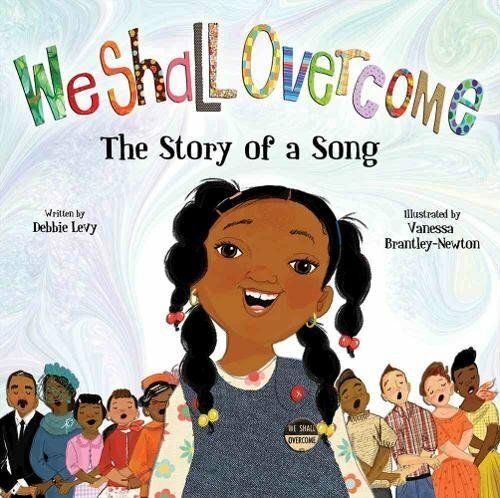 We honored Dr. King’s words by first reading aloud a picture book titled, “We Shall Overcome- The Story of a Song” written by Debbie Levy, and beautifully illustrated by Vanessa Brantley Newton. This book is a celebration of the history of the struggle for freedom as reflected through moments of the iconic song, “We Shall Overcome”. From the song’s roots in America’s era of slavery through to the civil rights movement of the 1960s and today, “We Shall Overcome” has come to represent the fight for equality and freedom around the world. 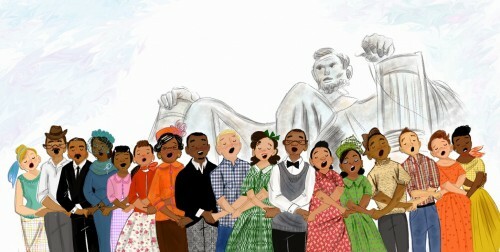 The book ends with the election of President Obama and is written in lyrical prose that makes for a poetic read-aloud. Children are engaged with bright pictures and inspiring words. 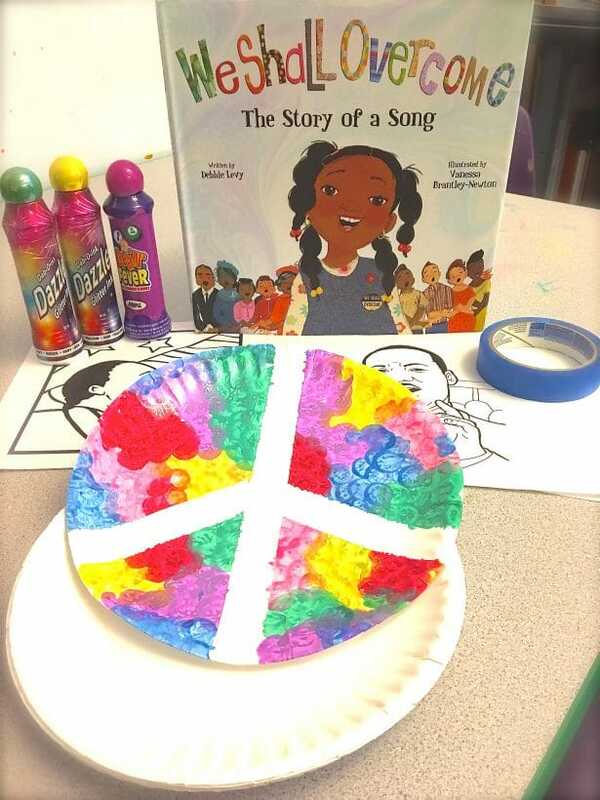 While the music was playing we made our own tape-resist peace signs using paper plates, blue painters tape, and dobbers! Put the blue painters tape down the middle of a paper plate making the peace signs lines, then just dob all over it using a variety of colors. Once you’re finished, you remove the tape and VOILA! You have a cool 1960’s peace sign of your very own. We also printed off some Dr. King coloring and fact sheets and colored them with crayons and markers. Here are some of the finished products. 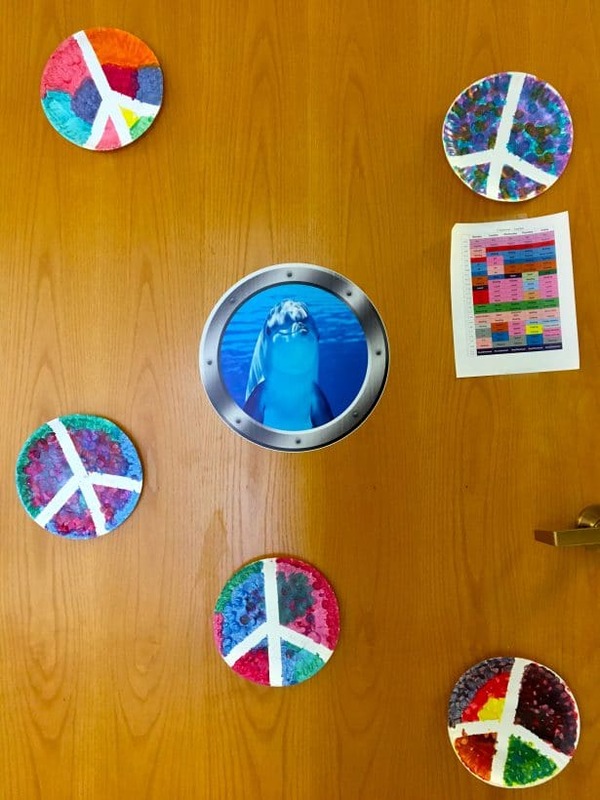 The dolphins classroom used the Peace Signs for their door decorations and I think they look awesome! This project is great for nearly any developmental level and is fun for all ages. I personally made about 8 of them through the course of the week. Let me know if you used this with your little ones, and how they turned out!